Complies with NHRA Rule 8:1. Required by NHRA when there is no firewall between driver's compartment and battery. Embossed Taylor logo in lid. 3 piece 040" aluminum box design allows access without removing battery from box. Hard mounts battery to the frame with supplied 3/8" bolts. Heavy duty one-piece welded battery hold down and mounting hardware included. Dimensions: 13.5" long x 9.5" wide x 10" high. Taylor Aluminum Battery Boxes are ideal for street rods, customs, and race applications where space is limited. They are made from .040" aluminum, and lids have an embossed Taylor logo. Taylor offers three box types to compensate for size and brand of battery application. 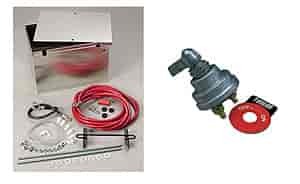 All boxes include battery hold-downs and mounting hardware to complete your installation.